It’s almost that time of year again, when respite from our hot and humid summers comes in the form of an ugly box we tend to stick out our windows. 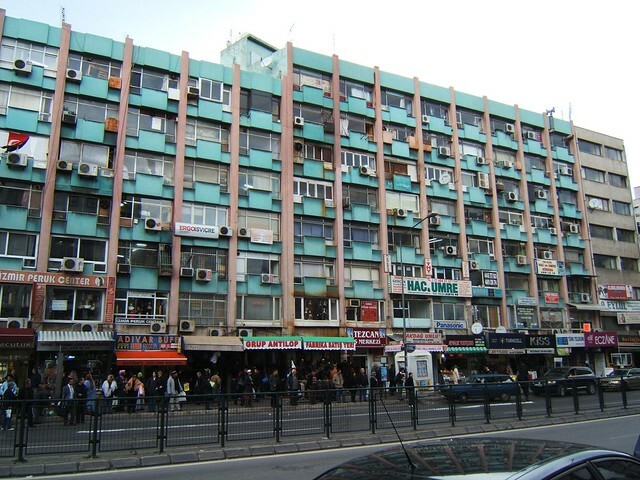 Despite its prevalence in the urban landscape — messing with the visual coherence of apartment building façades, introducing a variety of chemical refrigerants into the environment, or contributing to otherwise unsustainable cooling practices with excessive demands on water and energy — air conditioning is not an aspect of urbanism whose implications we often consider. What follows is Alison Carafa’s fresh and cheerful journey through some of the unintended uses for, hacks to and consequences of this unloved but, for many, indispensable addition to urban windows. The broader system of environmental technologies to which air conditioning corresponds — climate and atmospheric control — was the subject of a seminar at Columbia’s GSAPP this past fall, entitled “The Artificial Cryosphere” and led by instructor Nicola Twilley, author of Edible Geography and a couple of Omnibus features that explore how the networks and flows of food determine the shape of cities. Carafa’s “Field Guide To AC Units” emerged from work she prepared for that class, alongside student projects that explored everything from ice bridges to thermoacoustic heat transfer to vending machines. The ways in which refrigeration has affected patterns of trade, industry, settlement and architecture is an under-investigated theme of urban studies, just as the sensory experience of living in a city with a lot of window AC units — humming, dripping and potentially falling on your head — is an under-observed phenomenon of urban life. – C.S. Like its hum, the window air conditioner is so prevalent that it has completely receded from our conscious awareness. Though it pervades the landscape of many of our cities, we rarely appreciate how window units continue to shape our homes and street walls. The basic design of a window unit has remained mostly the same since it appeared on the market in 1935 — that is to say, functional and bland. But instead of designing a more elegant object, we have allowed AC units to become visual background noise. For an object that most people would say they cannot live without, an object that much of our modern world was built upon — without air conditioning, a city like New York would just be uncomfortable, but a city like Phoenix wouldn’t exist in its current form — this lack of attention seems odd. Introducing air conditioning into the older building stock of cities like New York demanded flexibility, with units that could be adapted to the building rather than requiring the building to adapt to them. (Perhaps the window AC unit can be seen as an unintentional agent of preservation, protecting buildings that would otherwise be ravaged by the integration of central air and drop ceilings.) And so, the window unit has generated its own architectural vocabulary. The flat facades of many buildings are transformed daily by the play of light and shadow created by units’ overhang as the sun moves across the sky. Cages, bars, brackets and shelves have been affixed to to the front of buildings as supports and, even when units are removed, they often stay behind as evidence of what used to be there. The common perception that window air conditioner units are temporary is then a strange reminder of the way we perceive certain everyday objects that populate our lives and our cities. Although individual units are often replaced or moved to different windows, the volume of space that they take up, whether stored away or installed between inside and out, is always there. Until all of our building stock is replaced or renovated, the window unit will always be found, humming away in the background. With all this in mind, I decided to scour the internet and the streets of New York City to see what else I could find out about this building block of modern living. From stories of falling units to birds nests to urban water farming, here are a few tales from the secret life of air conditioners. Here in New York, where closet space is limited, or non-existent, and the entrepreneurial spirit is always at work, companies have begun to spring up that offer winter storage for window air conditioning units. Now, along with the return of greenery and birds, we can list another indicator of spring’s arrival: the return of air conditioners from their long winter hibernation. For an average price of $200, a group of movers will show up at your door, remove your AC unit, bring it to their storage facility, professionally clean it, and store it. The removal of a unit not only allows for more efficient heating of the home, but also lets residents reclaim, if only for a few months, a forgotten view out of a newly-cleared window. Then, when the temperatures begin their steady rise, the service returns and reinstalls the AC unit. But be aware: the longer you wait to call, the longer it will take for its return. Like everything else in New York, there is always a line. Although most of the AC units found in New York City are high above our heads, those that are at ground level and within arm’s reach are often incorporated into the urban aesthetic. Some are incorporated into murals, while others become temporary art installations. The most common way that the units are decorated is with spray paint graffiti. A more unusual method used is the manipulation of the soft metal that makes up the metal mesh of the exterior air filter. With just a finger one can carve shapes and words or create a flowing expanse of silver waves. In need of something to prop up your leaning air conditioner? No problem! Just a quick look around your apartment and you can find dozens of items perfectly suited to the task. Here are some examples of things creative New Yorkers have used to more “safely” support their window units: an old amp, baby wipe containers, bibles, styrofoam, Chinese food containers, rope harness, newspapers, shelf brackets, wood slates, stones, terracotta pots, VHS tapes, wood scraps, the Yellow Pages, bowls, bricks, coffee tins, dictionaries, ice packs, old electronics plugs, records, books, rolls of tape, weights and a yoga mat. Every New Yorker knows the pain that is the New York City real estate market. But have you ever considered the market for a good place to build a nest? Many factors we consider when moving are the same for our avian friends. The higher the better — everyone likes a good view — as long as proper safety rails are installed to keep the kids from falling. And although Manhattan is appealing, it just might be safer to move to more suburban areas so that there is plenty of sky for the kids to play in. Make sure to look out for potential neighborhood dangers like feral pigeons or human children with slingshots before you even begin to look at locations. And most importantly, a good set of neighbors is essential — if they don’t want you there, you may just come home one night to find your house broken or gone altogether. It’s mid-summer, you are walking down the street and all of a sudden something drips on you, and it’s not rain. After making sure it’s not a surprise from our aforementioned avian friends, you look up and what do you see? An air conditioner. Before you cringe and wonder what that water contains, consider this: all that is falling from the 4,000,000 air conditioners throughout the city is pure and clean condensed water. Not only is this water the equivalent of the condensation that collects on a cold Coke can, it is, technically, drinkable. Fear the falling water no more. On an average warm and humid day, your air conditioner can drip up to two gallons of this purified water. Although most choose not to use this water for drinking, it can be used to water plants. It can either be collected in bottles or, for the handy ones out there, channeled directly from the condensor to your plants through a plastic or rubber tube. For a city with millions of window AC units carelessly hanging out of windows dozens and dozens of stories in the air, we rarely hear about one falling. Some claim that the lack of reporting about falling air conditioners is some sort of conspiracy and that pure statistical analysis proves that it must happen more frequently. Though my research found no reported incidents of death by falling air conditioner, there are many cases of units taking a plunge and causing severe injury. Take, for instance, the case of Lynda Kneish, 51, who suffered a crushed right leg, broken ribs, broken pelvis, fractured vertebrae and internal bleeding after a unit fell from the 3rd floor window of a building on the Upper East Side in 2006. Or Anthony Franzese, 67, who suffered from a head laceration in 2010 after a unit fell from a 6th floor window in the East Village. He credits a restaurant awning with saving his life after it slowed the AC unit’s fall. One reason more units don’t fall could be the attention paid by cautious landlords to make sure air conditioners are properly secured. There are no laws governing the installation of these units; any precautions taken are the choices of building owners and landlords. Tell that to Esidras Valles, 24, whose head was also lacerated after a unit fell from the 15th floor of a building on November 10, 2010. All three victims are more aware than ever of what dangers lurk above their heads, but none have fought for stricter laws governing the installation of air conditioner units. All have sued the city, and the landlords, for damages. One consequence of an improperly installed window unit is that an intruder or thief can easily remove it from the window, giving unwanted access to your home and possessions. Sometimes the unit is itself the target, as people have realized that stealing air conditioners can be surprisingly profitable. As much as 60% of the weight of an air conditioner is copper and the smaller the unit, the more copper it will have for its weight making a small, easily-carried unit worth the effort. Over the last few years the price of copper has gone up dramatically, averaging about $3.78 per pound in March 2012. A typical unit, which weighs between 20-90 lbs, might have 33 lbs. of copper tubing, at a value of $124.74. Screwing your air conditioner into your window with the brackets it comes with could prevent it from being stolen or removed. Do it. As the summer slowly drifts into July, those who are without air conditioners in their homes begin to get desperate. As a result, a variety of AC-based relationships have become commonplace for those singles without the luxury of air conditioning. As the Village Voice first declared, “When night falls and you are forced from your mechanically cooled office or after-work drinks environment, you will, with unprecedented perseverance and clarity of vision, become radar-focused upon gaining entry into the homes of persons with powerful new air-conditioning units…” So be wary of people looking to become “friends” during the warmest months of the year. Make sure that their intentions are pure and that your nicely cooled 5th floor walk-up is not really what they’re after. Or, if you’re in the market for an AC-based relationship, consider being open about your intentions — see one example from Craigslist above. Allison Carafa is a first-year student in Columbia’s Critical, Curatorial, and Conceptual Practices in Architecture program. She is interested in documenting the hidden and often disregarded architectures that are essential to our understanding of space. Brilliant! I love this piece. At last, someone has addressed “AC units — humming, dripping and potentially falling on your head” ! Thank you! Wonderful essay on observing the everyday unobserved. Personally, I like this extra urban chaos. Isn’t that what some of the currently famed architecture trying to achieve with pre designed facade treatments, screens etc..? This article gave me such a chuckle. Absolutely brilliant concept and execution! BRAVO! I was only yesterday complaining about the lack of inspiration in the city, yet by reading your article you have shown me there is a world of magic and wonder in even the most “practical” of devices. Thank you! Why are airconditioner back-ends so ugly? I’m sure a good industrial designer could come up with something fare more attractive and just as effective for similar production costs.